The hot spring and cool summer conditions have brought early and bumper autumn crops. There is a plentiful supply of fruits, seeds and berries and many trees are already showing their autumn colours. The conditions follow a record-breaking dry spring, a drought in parts of east and southern England, and a rainy and cloudy summer. As a consequence, orchards are said to be bursting with apples and pears. I thought last year was good, but this year its bonkers, so many apples in west Berks…!!! 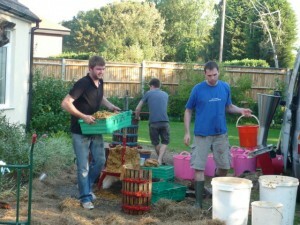 Shaking down the very large crop of Yarlington Mill cider apples. Five of the seven trees are cropping heavily this year, though sadly some of the the trees have suffered as a result. The very dry conditions seem to have made the wood drier and less flexible and the very heavy crops and high winds have caused several large branches to break under the strain. Robin Barnwell already has his cider racked off into the second set of demijons. 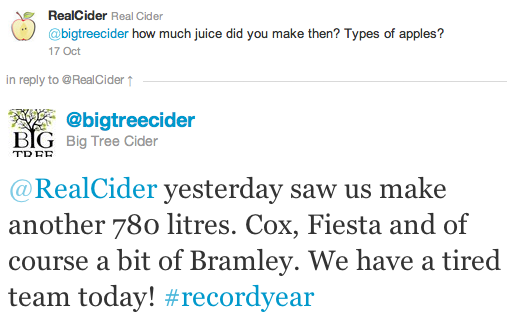 He uses local apples near Birmingham, Midlands – This photo shows the final racking off the lees. Could well be ready by Xmas! I use whatever I can get my hands on. This year came from our orchard plus nice people in Rushall who let me strip their tree. 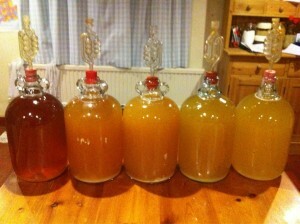 Second racking off, ready for Xmas? 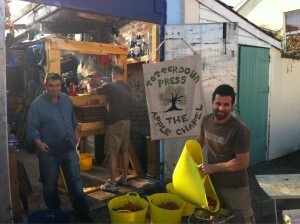 Totterdown Press in full swing!